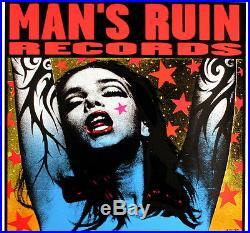 Title: Frank Kozik Man’s Ruins 1996 The Hammer of The Gods Original Concert Poster S/N. Band(s)- Kyuss, Melvins, Gwar, Dwarves, Swingin Utters, Fu Manchu, Helios Creed, The Unsane, Steelpole Bathtub, The Tards, Killdozer, Blag Dahlia. Hand Signed/Numbered- Yes, Yes (300 SERIES). Format- silkscreen, heavy stock. Size- 35 x 22.5 inches (height x width). Condition-/EX/VG Poster is new and has never been displayed. Overall image is excellent but the poster does have some minor edge bumps in areas as well as minor print imperfections. This poster is absolutely beautiful! A must have for poster collectors or simply a nice piece of art! POSTER CONDITION GRADING SYSTEM & CHART. We do our best at accurately describing the “general” condition of our posters (concert, promo, store, etc). We assign a condition to each poster which is applicable to a “generalized condition” category – this is always noted in the poster description detail. NM: Poster is crisp, clean and almost perfect. EX: Poster is almost new – may have very slight imperfections. VG: Shows minor aging. Slight edge/corner and possible surface wear or slight creasing. G: Visible signs of aging and wear (edge/corner/surface/tears). Possible discoloration and/or creasing/wrinkling. F: Distinctive signs of aging and wear: Tears, pinholes, slight creases, edge/corner and surface wear. Possible tape restoration — but simply still a very cool collectible piece. P: Has characteristics of FAIR condition but with irreversible damage or wear. Has historic / nostalgic value for a serious collector. ABOUT US: We specialize in authentic music memorabilia. We present hundreds of music memorabilia items weekly – featuring artists from all genres – but rock and roll is our passion. Be sure to check out all of our listings including our great deals for unbelievable prices! Our goal is to produce as many happy customers as possible. We specialize in authentic music memorabilia. Be sure to check out all of our listings in our store! 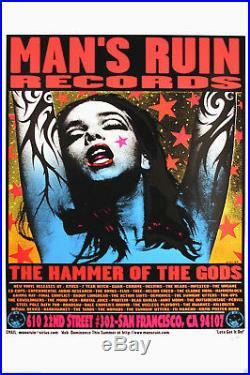 The item “Man’s Ruin Records 1996 The Hammer of The Gods Concert Poster By Frank Kozik S/N” is in sale since Sunday, October 14, 2018. This item is in the category “Entertainment Memorabilia\Music Memorabilia\Rock & Pop\Artists M\Other Rock & Pop Artists M”. The seller is “rock-on-collectibles” and is located in Houston, Texas. This item can be shipped worldwide.